You know those evenings at, oh, about 9 p.m., when you’re hanging out at home, maybe doing some work, maybe just watching some stand-up comedy on Netflix streaming, maybe doing both at the same time, and all of a sudden you get a craving for something sweet? Just a little something, maybe some ice cream or a cookie? But — uh-oh — there’s nothing sweet in the house. What to do? This recipe* is the perfect solution for those moments. (Which, admittedly, happen to me frequently. Case in point: I’ve made this recipe twice this week already.) 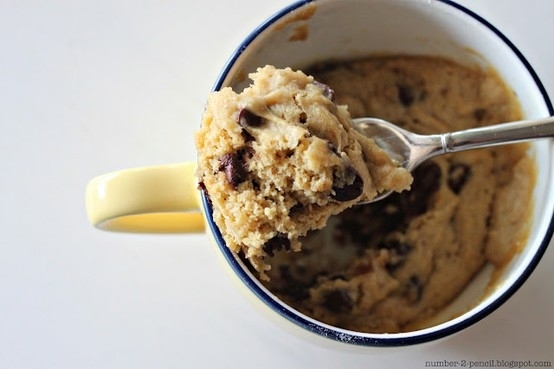 It tastes just like a freshly baked cookie, but takes all of about 2 minutes to make. Perfection, no? In a small, microwavable bowl, mix together butter, sugars, vanilla, and egg yolk. Add in the flour and salt and mix until well combined. Next Next post: Hey, Winston? Think You Can Get A Few Food Trucks? No kidding! This would have been oh-so handy!